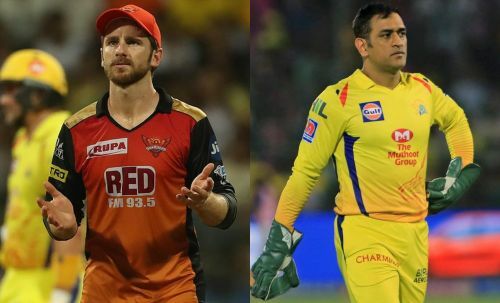 Sunrisers Hyderabad hosts the defending champions Chennai Super Kings in Match 33 of 2019 IPL at the Rajiv Gandhi International Stadium on Wednesday. With three wins in seven matches, the Men in Orange are at sixth in the standings while the Super Kings are at the pole position with seven wins in eight games. Having lost two of their four home matches so far, the Sunrisers will be determined to showcase their dominance in front of the vociferous fans but it's not going to be easy for them to derail the Chennai Super Kings, who are on a roll right from the word 'go' this season. Let us look at three reasons why MS Dhoni's men will prevail over the Surnisers in this mouth-watering encounter. After winning the first three matches, Super Kings suffered a defeat against Mumbai Indians at the Wankhede by 37 runs. Nevertheless, they bounced back strongly by clinching convincing victories in their next four games and enter this clash as the favourites. The Super kings enjoy a healthy head-to-head record against Sunrisers having won eight out of ten IPL games played so far. Last season, they won all four matches played against the Hyderabad franchise - away, home, Qualifier 1 and final. It's going to be a daunting task for them to stop the mighty Chennai Super Kings who will be looking forward to extending their winning run. From Faf du Plessis to Mitchell Santner, almost every player has contributed with the willow for Chennai this season. Their batsmen have stepped-up when most needed and their valuable knocks on crucial junctures showcase the depth of this power-packed batting lineup. Meanwhile, the Sunrises have been heavily reliant on openers, David Warner and Jonny Bairstow, with their middle-order failing to fire. Kane Williamson, Manish Pandey, Vijay Shankar, and Deepak Hooda must score heavily to steady the ship. Though the Sunrisers always been a dominant bowling unit, CSK 's bowling deserves special praise this season. From being economical to picking up wickets at regular intervals, the Chennai bowlers have been consistent so far this season. The likes of Deepak Chahar, Harbhajan Singh, and Imran Tahir have been menacing with the ball and the vulnerable SRH batting line-up must find a solution to tackle them.